Dere is a commission piece that I just recently completed. 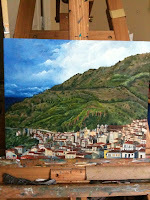 Its this little town nestled in the mountains in Italy called Callesano. The most challenging part was making sure I was able to capture the essence of this small town. I wanted to keep a really limited color pallette due to rustic and quiet nature of the town. I used cad red, cad yellow, naples yellow, ultramarine blue, burnt sienna, and burnt umber. Also coming up for first Thursday in December, my solo show at Equilibrium in December, which I will have several new pieces. Another December announcement is that I am in the big 100 which I will have 20 pieces. There is 100 artists which means 2000 pieces of art and it is a cash and carry show which is right on time for the holidays. big 100 is the night justin and i will be in town. :) we are totally gonna have to go.